We are in a new season, so as we sort out our cupboards and pack away our winter clothes, well some of them. We look to the all the changes Spring brings in. While we are changing, packing and embracing the season you should also do the same for your blog. Being focused on adding content and not taking notice of the finer things makes this the best time to give your blog that once over to make sure everything is in working order so you have user-friendly blog. 1 - Keep your font size at a reasonable size. Ideally, you want to have it at 14 px. 2 - Don't used too many colours, which can conflict with your images. There are many sites that are focused on colour combinations yet still work as an overall theme. 3 - Check all your links, actually go to the place they are label as. We don't want blank pages or worst still 404 error pages. Even if you have created a funky 404 error page, its better for it not to be used or seen by your users. For it means every link is working as it should. 4 - Don't tease your visitors unless its part of their blogging experience, For example, they click on a link and it says "coming soon" or "Being updated". If you have nothing to put on the page other than those statements, don't add the link. Wait until you can actually fill the page with the actual content that needs to be there first. 5 - Keep your sidebar short and sweet but it also depends on your blogging intentions. If your blog is an extension of your business then keep it short and sweet and the links used should link to your business products. If your blog is your business then you can add a little more, make it relevant to your blogging theme. However make it worthwhile, visually appearing but yet uncluttered. 6 - Hang back on flashing images, unless your blog is offering flashing images as its main focus. Unless its the latter don't use them for they distract the user and can slow down the time it takes to load the page. 7 - Keep your file size of images as small as possible. Ideally you want to use gifs, but sometimes jpeg will be smaller. 8 - Don't let your visitors click more than twice to get to anywhere on your site. 9 - If your shop is also your blogging space, then add visual eye-catching imagery to your homepage to stop visitors in their tracks. They can read your welcome message or who you are after they have looked at your images. Position your images, gallery or slideshow above the fold of your site and text can come after it. 10 - Check to see if your contact form is working. Send yourself a message to check it out. If it's not working and you can't fix it straight away, have you got your email address written there for them to use instead? What have you found annoying at other sites you have visited? Have you found any of the above on your blog, share now don't be shy? 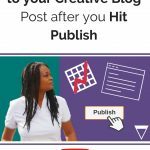 What else are you thinking to do to your blog after reading this post? Nullam et, mattis elementum venenatis tempus porta.